Building the best side in FIFA 19Ultimate Team isn’t simply putting the best rated card at each position. Chemistry plays a significant and complex role in your players’ attributes. It takes smart decision-making informed by an understanding of how chemistry works to get the most out of your team. There are two values to consider when developing your starting 11: Team Chemistry and Player Chemistry. This guide will tell you how both are raised and lowered, how they affect a player’s ratings, and where to find that information in Ultimate Team. This figure, which ranges from 1 to 100, is prominently displayed in the top right of the squad building screen. It is most affected by players adjacent to one another in the formation being from the same club, league, or nation. If two or three of those conditions are met, there will be a green line (indicating great chemistry) connecting the two players. One of those creates an orange line (good chemistry). None is a red line (no chemistry). In this image, Lewis Dunk (the center back) of Brighton & Hove has an orange line with Serge Aurier (the right back) of Spurs, because both play in the Premier League. Dunk has a green line with James Milan (the center midfielder) of Liverpool because they are both the same nationality and play in the same league. The red lines to other players mean no such connections are present. The more of these connections, and the stronger they are, the higher the overall team chemistry is. That figure goes into a formula along with individual player chemistry that produces attribute boosts — or penalties — for each player. Each player has a Player Chemistry rating from 1 to 10. To see it, click the right thumbstuck while hovering over a player in the squad building screen. It will show the team’s chemistry, the player’s chemistry and his chemistry style atop the card. Beneath that are the player’s attribute numbers, with bonuses or penalties, listed to the side showing how that figure is affected by the combined Player and Team Chemistry, which we’ll call Overall Chemistry. Player card for striker Jay Rodriguez of West Brom, showing both his squad’s team chemistry (56), his own player chemistry (7) and the modest bonuses he receives to his shooting and physical attributes. Generally speaking, you will want a competitive club to have a Team Chemistry of 75 or better. It will take some time to work up to this level of togetherness. But at 75 or better, the Team Chemistry will be good enough that an out-of-position good or great player won’t, at least, have his high ratings shredded by a low Player Chemistry, and will more likely see some modest boost thanks to average Player Chemistry and the good Team Chemistry. Is Chemistry more important than Player Ratings? They’re equally important in that you can’t afford to build your team with only one in mind. It’s possible to have a player’s high ratings decimated by poor Team Chemistry. And it’s possible that a player with middling ratings will see them significantly improved by great Team Chemistry. It might also be more advantageous to put in a lower rated player who still helps the Team Chemistry, to give a bigger boost to better players at more important positions elsewhere. For instance, here is one player, the 86-rated Ivan Perisic, but he is playing out of position in this formation and his Player Chemistry is only 2, giving him a -11 penalty to every attribute. Replacing him with Ruben Vinagre, a left wingback playing in position, who is a full 20 points lower in overall rating, improves this team’s overall chemistry by two points. Moreover, even if Vinagre is taking a -3 penalty in all of his attributes, some are still higher than Perisic’s. Constantly striving for green lines and position indicators may give you a dull team or one in a formation that doesn’t really suit your style of play — although it is a great way to get more out of lower rated cards at the beginning of an Ultimate Team campaign. Driving for the best player rating at all 11 positions, particularly in the early goings, could give you players out of position who suffer huge penalties to their attributes. Only in the case of rare, very highly rated or special edition players should you disregard the chemistry implications altogether. How Do I Raise Player Chemistry? You can raise the Player Chemistry figure with one of two bonuses, both adding +1 to the figure (capped at 10): Loyalty and Manager. The Loyalty bonus (+1 to Player Chemistry) is conferred when a player is used in 10 matches. Players that are found in packs automatically have this bonus. The Manager bonus (+1 to Player Chemistry) comes when the player and the manager share either the same league or same nationality. There are 22 Chemistry Styles in FIFA 19 Ultimate Team, which are found inside Gold and better card packs or bought for FUT Coins on the transfer market. Prices will vary when trying to buy them straight out, with averages ranging from a couple hundred coins to a couple thousand, depending on rarity. (For comparison’s sake, a typical pack of Gold-level FUT cards costs 7,500 coins.) 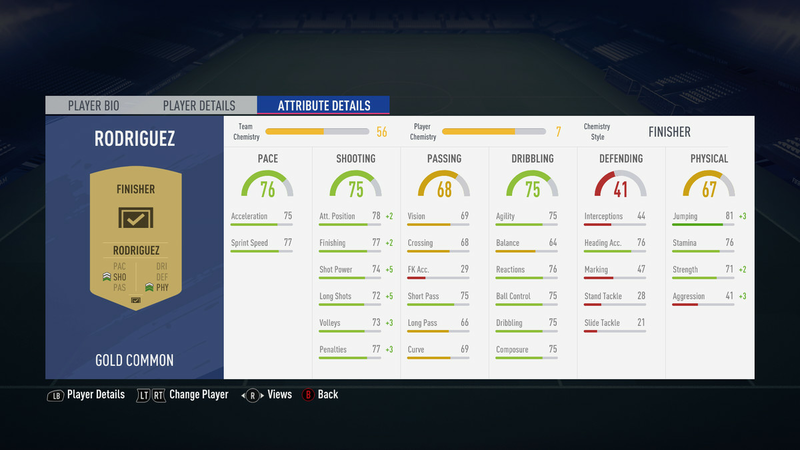 All players have a Basic Chemistry Style by default, which gives maximum bonuses of +5 (+10 for goalkeepers) in a spread of attributes for top Team Chemistry. Use Chemistry Styles from the squad building menu. Select Player Actions, then Apply Consumables, and cycle over to the Styles category to see the one(s) available for this player. Once applied, it’s gone — a Chemistry Style can be replaced by another style, but it can’t be removed from one player and applied to another. Basic: Sprint Speed +5, Attacking Position +5, Shot Power +5, Volleys +5, Penalties +5, Vision +5, Long Pass +5, Short Pass +5, Curve +5, Agility +5, Ball Control +5, Dribbling +5, Marking +5, Standing Tackle +5, Sliding Tackle +5, Jumping +5, Strength +5. Hunter: Acceleration +10, Sprint Speed +10, Attacking Position +5, Finishing +5, Shot Power +10, Volleys +15, Penalties +15. Catalyst: Acceleration +10, Sprint Speed +10, Vision +15, Crossing +15, Free Kick Accuracy +10, Short Pass +5, Curve +5. Shadow: Acceleration +15, Sprint Speed +10, Interceptions +10, Heading Accuracy +5, Marking +10, Standing Tackle +5, Sliding Tackle +15. Sniper: Attacking Position +5, Finishing +15, Volleys +10, Penalties +15, Agility +10, Balance +5, Reactions +5, Ball Control +5, Dribbling +10, Composure +5. Finisher: Attacking Position +5, Finishing +5, Shot Power +15, Long Shots +15, Volleys +10, Penalties +10, Jumping +10, Strength +5, Aggression +10. Deadeye: Attacking Position +15, Finishing +15, Shot Power +10, Long Shots +5, Penalties +5, Vision +10, Crossing +5, Free Kick Accuracy +5, Short Pass +10, Curve +5. Marksman: Attacking Position +5, Finishing +10, Shot Power +5, Long Shots +10, Volleys +10, Penalties +5, Agility +5, reactions +5, Ball Control +5, Dribbling +5, Physical +10, Strength +5, Aggression +5. Hawk: Acceleration +5, Sprint Speed +5, Attacking Position +10, Finishing +5, Shot Power +10, Volleys +10, Penalties +10, Jumping +10, Strength +5, Aggression +10. Artist: Vision +15, Crossing +10, Long Pass +15, Short Pass +5, Curve +5, Dribbling +10, Balance +5, Ball Control +10, Dribbling +10. Architect: Vision +10, Crossing +15, Free Kick Accuracy +5, Long Pass +15, Short Pass +10, Curve +5, Agility +10, Balance +5, Ball Control +10, Dribbling +10. Powerhouse: Vision +10, Crossing +5, Long Pass +10, Short Pass +15, Curve +5, Interceptions +5, Marking +10, Stand Tackle +15, Sliding Tackle +10. Maestro: Attacking Position +5, Shot Power +10, Long Shots +10, Volleys +5, Vision +5, Free Kick Accuracy +10, Long Pass +5, Short Pass +10, Agility +5, Reactions +5, Ball Control +5, Dribbling +10. Engine: Acceleration +5, Sprint Speed +5, Vision +5, Crossing +5, Free Kick Accuracy +10, Long Pass +10, Short Pass +5, Agility +5, Balance +10, Reactions +5, Ball Control +5, Dribbling +10. Sentinel: Interceptions +5, Heading Accuracy +10, Marking +10, Standing Tackle +15, Sliding Tackle +15, Jumping +10, Strength +10, Aggression +10. Guardian: Agility +10, Ball Control +10, Dribbling +5, Composure +5, Interceptions +10, Heading Accuracy +5, Marking +15, Standing Tacke +10, Sliding Tackle +15. Gladiator: Attacking Position +10, Finishing +5, Shot Power +10, Long Shots +5, Interceptions +10, Heading Accuracy +15, Marking +5, Standing Tackle +10, Sliding Tackle +15. Backbone: Vision +5, Crossing +10, Long Pass +5, Short Pass +10, Curve +5, Interceptions +5, Heading Accuracy +5, Marking +10, Standing Tackle +10, Sliding Tackle +10, Jumping +5, Strength +5. Anchor: Acceleration +5, Sprint Speed +5, Interceptions +5, Heading Accuracy +10, Marking +10, Standing Tackle +10, Sliding Tackle +10, Jumping +10, Strength +5, Aggression +10. Basic: Goalkeeper Diving +10, Goalkeeper Handling +10, Goalkeeper Kicking +10, Agility +10, Acceleration +5, Goalkeeper Positioning +10. Wall: Goalkeeper Diving +15, Goalkeeper Handling +15, Goalkeeper Kicking +15. Shield: Goalkeeper Kicking +15, Agility +15, Acceleration +10, Sprint Speed +5. Cat: Agility +15, Acceleration +10, Sprint Speed +5, Goalkeeper Positioning +15. Glove: Goalkeeper Diving +15, Goalkeeper Handling +15, Goalkeeper Positioning +15. What are the bonuses if Team and Player Chemistry are less than perfect? Subtract 50 from your Overall Chemistry score. Divide the difference by 50. Multiply the quotient by the maximum possible bonus (15, 10 or 5 depending on the attribute and the Chemistry Style, if any, that is equipped), rounding up. For example, here’s Jim Hunter, a decent card you get very easily for playing the first chapter of The Journey: Champions, FIFA 19’s story mode. Hunter automatically has 10 Player Chemistry. On a team with Team Chemistry of 54, his Overall Chemistry is 88.5, according to the formula above. So, with the Finisher Chemistry Style equipped, he gains +8 to Volleys (88.5-50 is 38.5, divided by 50 is 0.77, multiplied by the 10 maximum for that attribute is 7.7, rounded up to 8). Conversely, say a player has poor Player Chemistry on a team with good Team Chemistry. In this image supplied by EA Sports, Paulo Dybala has a 2 Player Chemistry on a team with 76 Team Chemistry. This poor fit drops all of his attributes -8. The starting lineup sets Team Chemistry, and it does not change mid-match with substitutions, formation changes or other management decisions. All substitutes are therefore assigned a flat Player Chemistry of 5. This means there is no penalty for playing them out of position. However, the 5 Player Chemistry limits a substitute to an overall chemistry of 62.5 if the starting lineup has a perfect 100 Team Chemistry. The highest bonus they would see is a 4, if they have a Chemistry Style equipped that otherwise gives out a +15. A Player with no Chemistry Style equipped will only gain +2 to his attributes, maximum, and needs a starting lineup Team Chemistry of 70 to get +1. A team with less than 50 Team Chemistry is going to give a substitute a -1 penalty to all attributes, worsening with lower Team Chemistry. How do I improve my chemistry through the Transfer Market? When searching the Transfer Market to acquire a specific player, that player’s Player Chemistry, and his effect on your Team Chemistry, will be shown before buying him. It looks like this on your screen. 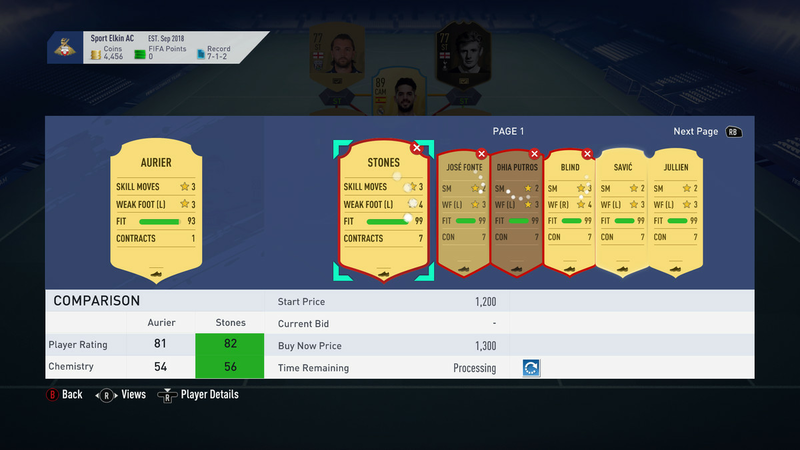 Before buying John Stones, a modest improvement for just 1,300 Coins, we can see that he is better in both overall rating and in how he affects the Team Chemistry. 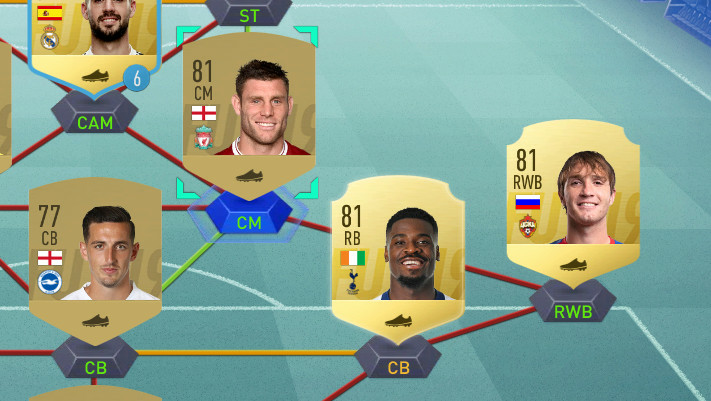 Clicking the right thumbstick will show the bonuses Stones will see as a result of the Team Chemistry and his Player Chemistry if he replaces Serge Aurier.